Eight 3.25" square, 7/16" thick slabs of colorful wood are hung on a 4" stainless steel skewer. Great toy for those Busy Beaks in your house. 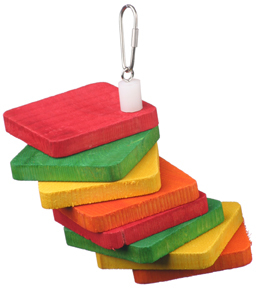 Reusable skewer is refillable and sure to put a smile on your parrot's beak! This fun toy is, topped with a nickel plated pear shaped quick link for easy hanging. Good toy for a variety of parrots, smaller to mid-large sized beaks!